Add some beauty to the party with our cherry blossom design wrappers. Stylish, sophisticated and the perfect addition to any spring affair, and Bridal Shower. 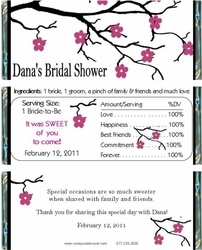 Our CHERRY BLOSSOM CANDY WRAPPER is a top seller and just the right favor for the modern bride-to-be.